After lunching the flagships Huawei P20 and P20 Pro last week, Huawei has launched a new smartphone in the Honor series with the name Honor 7A that comes with a full-view display and comes with dual rear cameras. It also comes with Android 8.0 Oreo OS pre-installed. The new Honor 7A is priced at 799 yuan (around $126) that comes with 2GB RAM + 32GB inbuilt storage capacity and the second variant with 3GB RAM + 32GB inbuilt storage is priced at 999 yuan (around $158). It comes with Black Gold and Blue color options and is currently up for pre-order in China. It will go on sale starting from April 3rd in the country. No details available about its global debut as of now. 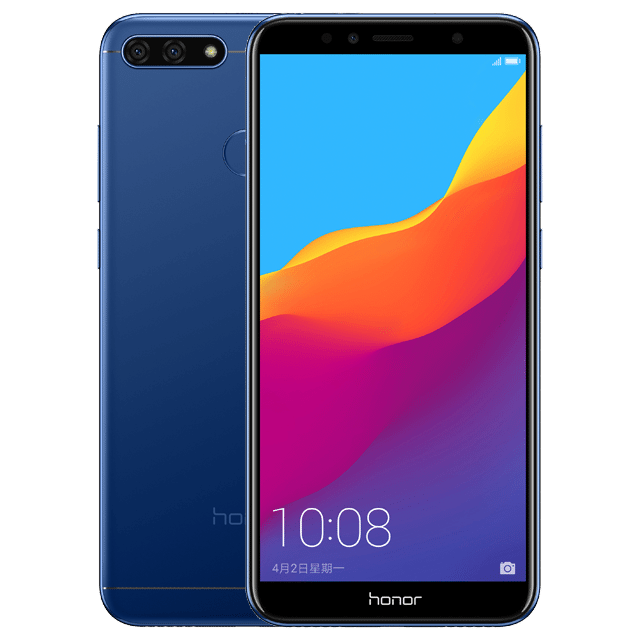 The Honor 7A features a 5.7-inch 18:9 FullView 2.5D curved glass display with 1440 x 720 pixels resolution and is powered by an Octa-Core Qualcomm Snapdragon 430 ( 4 x 1.2 GHz Cortex A53 + 4 x 1.5 GHz Cortex A53) 64-bit Mobile Platform with Adreno 505 GPU. It comes with 2GB / 3GB of RAM with 32GB inbuilt storage variants and supports expandable storage up to 256GB with microSD card slot. It runs on the Android 8.0 (Oreo) with EMUI 8.0 on top and supports Dual SIMs. It features a dual rear camera with a 13-megapixel rear camera with LED flash, f/2.2 aperture along with a secondary 2-megapixel rear camera. It has an 8-megapixel front-facing camera with LED flash and f/2.0 aperture. It iss backed up by a 3000mAh non-removable battery and comes with 4G VoLTE, Wi-Fi 802.11 b/g/n, Bluetooth 4.2, GPS + GLONASS, 3.5mm audio jack and FM Radio support as well. It has a fingerprint sensor on the rear side. It measures 152.4×73×7.8mm and weights 150 grams. To recall, the company's latest flagship Huawei P20 Pro features a 6.1-inch Full HD+ OLED 2.5D curved glass display with 2240 x 1080 pixels resolution and is powered by an Octa-Core Huawei Kirin 970 (4 x 2.4 GHz A73+ 4 x 1.8 GHz A53) 10nm processor + i7 co-processor,Mali-G72 MP12 GPU and NPU. It comes with 6GB of RAM and 128GB of internal storage capacity. It runs on the Android 8.1 (Oreo) with EMUI 8.1 and supports single and Dual SIMs. It features a Triple rear camera with a 40-megapixel (RGB, f/1.8 aperture) + 20-megapixel (Monochrome, f/1.6 aperture) + 8-megapixel (Telephoto, f/2.4 aperture) cameras with Leica VARIO-SUMMILUX-H lesness, dual-tone LED flash, laser focus, deep focus, PDAF, CAF, 960fps super slo-mo. It also has a 24-megapixel front-facing camera with Sony IMX576 sensor and f/2.0 aperture. It comes with a 4000mAh battery with fast charging and connectivity options available are Dual 4G VoLTE, WiFi 802.11ac (2.4GHz/5GHz), Bluetooth 4.2 LE, GPS, NFC, USB Type-C, USB Type-C Audio, HiFi audio with HWA, Stereo speakers, Dolby Atmos. It has a fingerprint sensor on the front panel below display. It measures 155 x 73.9 x 7.8 mm and weights 180 grams.